Last Friday, I met up with my high school classmate whom I have not seen since we graduated 28 years ago. OK y'all, stop doing the math....LOL! As a gracious gesture, my dear friend Ms. M gifted me this delectable confection. These chocolates are rich and just plain delicious, I don't know how else to describe it, but the one that really stood out was the one with a red top which is actually "Ginger With Sea Salt." I happen to like ginger so this is a welcome treat. For some, I think ginger is an acquired taste. But for it to be paired with dark chocolate was just unbelievably tasty. My other favorite is the one with the embossed leaf on top called "Triple Crunch. 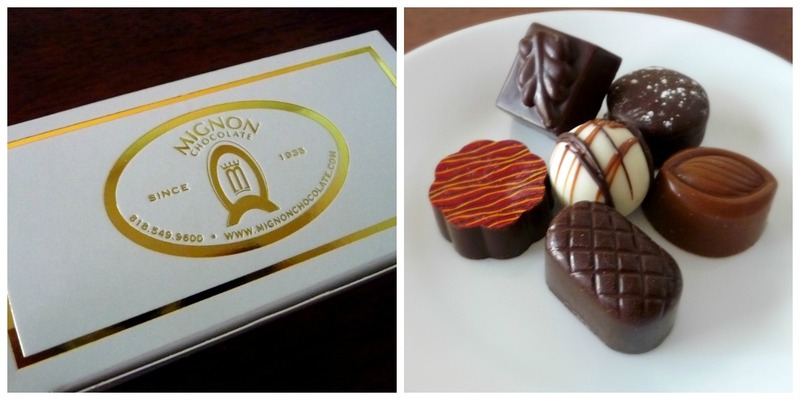 For a location of a Mignon Chocolate near you, click here. Can I just tell you, I think I will be driving to Mignon soon. I used 100% cotton canvas fabric, cotton belt strap for the handles, and double fold bias tape to reinforce the side seams.